"I draw most of my inspiration from what I observe in and around my home which is nestled in the woods of Pataskala, Ohio. It's a privilege to be able to express on canvas the peace and harmony conveyed in nature’s beautiful backdrop. My landscapes offer the onlooker an appreciation of the majesty of vistas that change from one season to the next. Crystal blue seascapes harken me back to wonderful beach vacations shared with my family". One doesn’t have to go to the country or seaside to appreciate nature’s calming beauty since Robinson’s work aptly expresses the peace and harmony that can only be conveyed in nature’s back drop. Join us for a special Psychic Saturday on April 13th from 11 am to 4 pm. Willow, Debe, and Lisa will conduct 20 minute private readings @ $35 each - for cash or $37 with a credit card, paid after your session. We will try our best to accommodate walk-ins but strongly suggest you book a RESERVATION IN ADVANCE by calling (614) 855-4856 or sending your time request to hayley@hayleygallery.com. My hands, my soul and my mind converge on each piece of work. The outcome is a sculpture or painting that triggers a tangible, personal emotional response. Best of all those emotions are shared, not isolated to the artist but the viewer as well. Inspiration arises, often without warning, from any number of life’s seemingly random scenes whether good or bad. After all, we are living in an ever-evolving work created by The Greatest Artist of all. For metal art sculptures, I find that fluid lines and almost limitless perspective really entice the eye to investigate, much like the curious environment that we occupy. Even if the work is linear, an appropriately applied patina or even applying additional metal can introduce motion that otherwise would leave the piece stagnant. Sculptures are often active but remain balanced and resolve themselves like a well composed song. I love to work with the various ferrous and non-ferrous metals like copper, steel, aluminum, and bronze. Occasionally combining these elements together alongside concrete, wood, and glass really give them life. A variety of heat or chemical processes helps me transform the work into something special. For canvas art, anything is possible in the abstract realm. I’m free to run spontaneously. One idea or inspirational mark may lead to something entirely sublime in the end. I’ve always been drawn to the earth tones, especially those of the Southwest United States where I was raised. From the reds and browns of the Sedona canyons, the lively greens of the valley, to the majestic hues of blue, red, orange and purple as the sun allows the desert night to take the shift. These are my soul colors but that doesn’t limit me from the spectrum of colors available. They are all beautiful. I never limit myself to any one tool for the application of paints. One piece of work may utilize brushes, water, tape and compressed air while another may utilize an inline or orbital sander for vibrating pigment. The creative possibilities are only limited by the desire to try something new. For me, art allows the gates to the unknown to open where I can rush in to fill the void, the void that the ordinary had previously occupied. 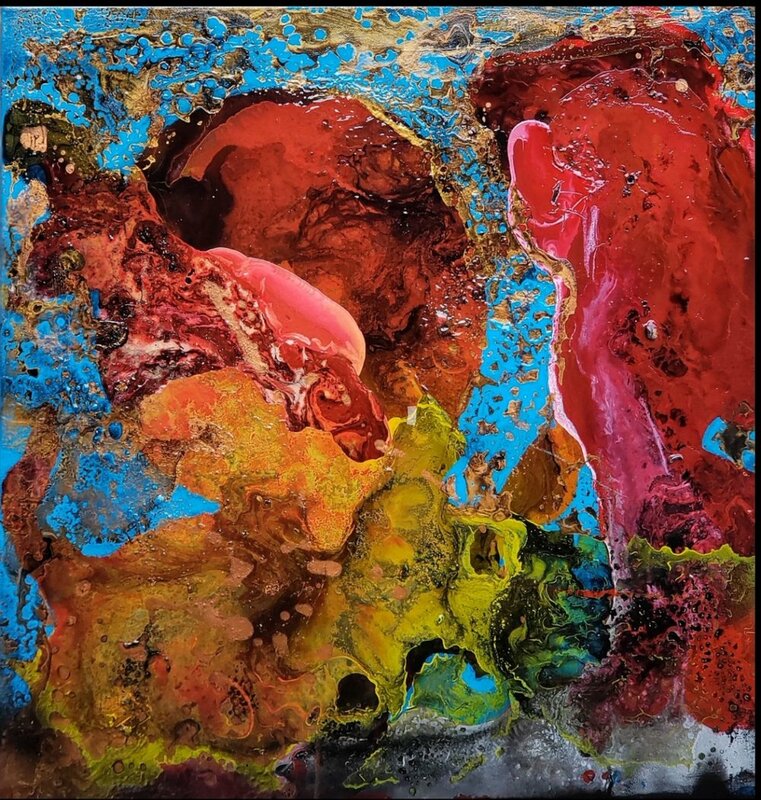 Tony Lee - I am an abstract artist located in Kettering, Ohio. From a very young age, I was obsessed with drawing and spent every moment practicing my skills. I studied figure drawing in college and graduated with a Fine Arts Degree from the University of South Carolina in 1979. My favorite artists included Monet, Van Gogh, Cezanne, Rembrandt and Frank Frazetta. My medium of choice is acrylic because it’s versatile and fast-drying. I use vivid colors combined with texture and contrast is to create abstracts on canvas. Clouds and nature are my inspiration, but the options are limitless. Abstracts are rewarding because the idea of what I envision changes as I work and it’s always interesting to see how others interpret my art. Priya Rama - I experience. Then, I paint. My art, like my life, revolves around my chronic migraines. Everything that I do follows the ebb, flow and crest of wellness. When a migraine comes on, even with my eyes closed, I "see" things. Colors and shapes flood my mind in fluid poetry. These mystical images recede, shift, radiate and pulse, becoming more vibrant and vivid with every capture! Frequently, I paint through a migraine, trying to quickly tap into what I see. When I can’t, I’m able to recall the imagery at a later time, and commit that to canvas. It can transform pain into beauty. I think of myself as an abstract expressionist, with my paintings highlighting a spontaneous and personal mark-making. Even though I wouldn’t call my paintings portraits, all of my works are self-portraits in a way. My art is part of me and I am part of my art. I hope that my paintings inform viewers about the migraine experience. And inspire them to engage in creative activities when faced with chronic pain, illness, stress, and life-altering events. Priya Rama has done her Doctoral Studies in Arts Administration, Education and Policy from The Ohio State University. She has an MA in Visual Arts Education from University of Cincinnati, and a BFA in Communication Arts and Design from Virginia Commonwealth University. Priya has exhibited at various venues, both nationally and internationally, and her paintings can be found in private collections around the country. She also has extensive teaching experience, and has presented/published nationally. "My paintings are an expression of my love of nature. As a child my desire to draw began at an early age and I would put to use any paper surface my mother could provide for me. I hope to convey to the viewer the passion, beauty, and reverence i feel when exploring our magical natural world." Majoring in fine art at Kent State University, Carolyn focused on painting the figure. Her study of the human form proved later helpful in her anatomical renderings of the wildlife in her paintings. She worked as a graphic artist immediately after college and later for seven years as an illustrator's assistant. Close observation, photography and her almost daily treks into the woods, fields and along the Big Walnut Creek, over which her studio sits, have been the inspirational reference for her richly colored, realistic oil paintings. Carolyn has been included in local and national juried competitions in which she has been recognized and awarded for her paintings. European native Natalya Romanovsky grew up in Moldova. From the time she was 7 years old, Romanovsky knew she would be an artist. That's when her teacher told her mother, Give her brushes and paint. The child will know what to do. Romanovsky received her Bachelor of Science degree in Graphic Design from Kishinev Art College. Romanovskys' paintings are a combination of vibrant color, rich texture and movement making them extremely exciting. There exists a mysterious and intriguing ambiance in every painting reminiscent of something surrealistic leaving the viewer to find a simple meaning of life in each one. To me, painting is relaxing and my way of getting time with God and His creation. I want to soak it in, to understand it as well as I can, and then capture the special beauty in life as light and shadow splashes across the scene. I enjoy painting so many different subjects- everything from architecture to wildlife to cityscapes to rural scenes. I have always loved being outside so I really enjoy plein air painting. Nature never fails to reward and challenge me as an artist with its constantly changing colors, light, and atmosphere. When painting, I depend on my design skills as a graphic designer, spirited brushstrokes and tonal unity. I also enjoy working in my studio in Ashland, Ohio when I can not get outside. Robin graduated from Ashland (College) University in 1982 with a Bachelor of Science in Visual Communication after spending one year of intensive study at the Art Institute of Pittsburgh. After years of work at agencies and as the head of graphics at Rubbermaid in Wooster, Ohio, Robin opened Red Red Design, a graphic design studio in Ashland, Ohio in 2001. Artist Opening Reception for Mary Burkhardt "Artful Dressing"
with a passion for travel, cooking, and fashion—naturally inform her art. in the color of the sky, signaling an approaching storm or a glowing sunset. viewer's own narrative of risk and refuge, real or imagined. I received my undergraduate degree from Bluffton University and my Masters degree from the McGregor School of Antioch University. I studied painting at the International School of Art in Umbria, Italy. I currently paint, teach high school art and live near Urbana, Ohio. Nature's vibrant colors and radiant light call me to paint. I concentrate on composition and use a loose, painterly approach, which allows the viewer to engage with the painting. My mediums of choice are both oil and ink with watercolor. After receiving an Economics degree from Denison University, I continued my studies at Cleveland State University to develop my interest in art. More recently, I have advanced my technique with mentors including Joe Lombardo, Fred Fochtman and Steven Walker. I am a member of the Worthington Area Art League, Central Ohio Plein Air Society, Dublin Area Art League, Urban Sketchers of Columbus and Rick Dziak's "The Group"
Coming to terms with the fact that I was losing my eyesight was actually when I first began to see the world much more clearly. We often spend our days over scheduled with things to do and places to be. Consumed by brief memories of what something was or the thought of what it could have been, wethen quickly move on to the next pressing moment. We can easily get caught up living in this rapid paced blur, and unknowingly are missing out on the incredible beauty that surrounds us in any given moment. I realize that losing my eyesight was a wake up call. I needed to take the time to see the world we live in. It is such a beautiful and inspiring gift to have the opportunity to slow down and appreciate every moment and each amazing experience. This was the turning point for who I am now and the artist that I have become. Man-Wai Wu was born in Guangdong China and settled in Hong Kong in 1958. He started painting in 1969 and later completed an extension course in 3-dimensional design at the Hong Kong Polytechnic Institute. In both 1989 and 1994 he was awarded the Hong Kong Urban Council Fine Arts Award for Sculpture by the Hong Kong Museum of Art. Wu won the Freeman Foundation Fellowship to study art at the Vermont Studio Center, the largest international residency program in the US, hosting more than 50 visual artists and writers each month from across the country and around the world. In 1998, he immigrated to Canada and has been working there ever since. His paintings have been featured in American Art Collector Magazine and he has collectors throughout the world. Wu has family, including a brother and many cousins living in Columbus, hence his connection to Central Ohio. I received my BFA from Bowling Green University with a concentration in oil painting in 1997. I currently work in 2 dimensional mixed media art. 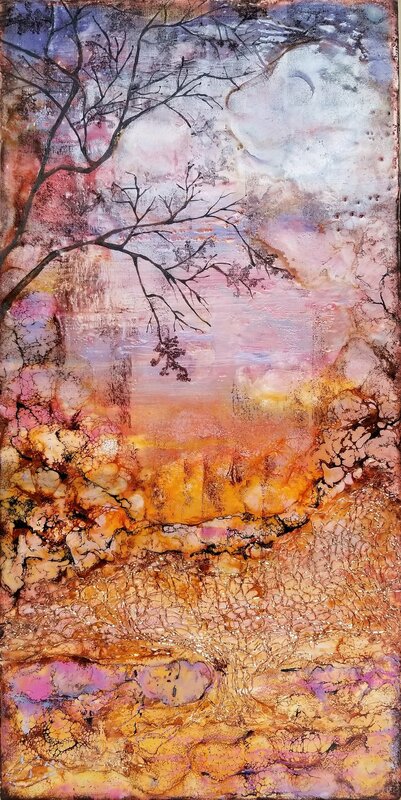 Most of my art is done in encaustics (painting with beeswax mixed with resin and pigment). It’s such a versatile medium and offers endless ways to explore. I love that I can make the surface of a painting incredibly smooth or I can carve and embed objects into the wax. Painting with liquid wax is both satisfying and challenging. The wax has to be heated to around 200 degrees to be able to paint with it. It hardens quickly once it touches the wood canvas and has to be fused in layers with a heat gun or a blow torch. Some of the materials I love incorporating into wax are handmade papers, vintage book pages, my grandmother’s old sewing patterns, beads, threads, and dried botanicals. I feel like I can express my love of nature and create atmospheric work best in this way. Melting the wax and fusing each layer to the previous one takes quite a bit of practice and patience. The process of building and taking away reflects so much of how I feel about life. We are always building and repairing ourselves. My pieces are typically a reflection of how I feel about things I see in nature or my surroundings. In a way I’m trying to share the sense of the mystery, beauty and sometimes decay I see in life and nature. Wil Wong Yee was born and raised in Columbus Ohio. At an early age, he found his passion in art. Yee graduated from CCAD, Columbus College of Art & Design, earning his Bachelors of Fine Art in Industrial Design. Being the designer of his destiny, Yee has taken pieces of the city of Columbus and created inspiration in the form of street art. After graduating from CCAD, Yee continued to create beautiful views of downtown Columbus in the form of cityscapes as well as personable portraits packed with raw emotion and thrilling illustrations. Artist Opening Reception for Shannon Godby "From Reality to Here"
Hayley Gallery welcomes a show dedicated to The Goodwill Art Studio & Gallery, an innovative fine arts program for people with developmental disabilities and other barriers. The studio and gallery provides a rewarding environment on so many levels. It is open to adults with any disability, creating a diverse studio environment. For the artists who create here, it is a place of self-expression and personal growth. For the volunteers who lend their time, it is a place of fulfillment. And for the patrons of the arts, it is a source of inspiring collections and talent. 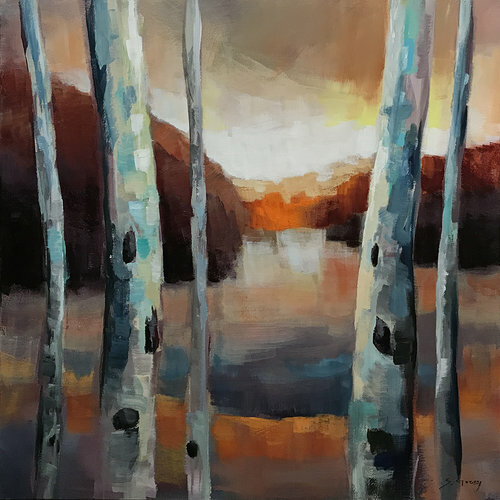 Melodie Thompson: Born and raised on a farm in Leesburg, Indiana and then living in North Carolina for several years, Melodie moved her studio from Worthington, Ohio to Indiana and now back to Ohio. She became a part of the arts community at an early age; teaching classes, painting murals, supporting philanthropic efforts and entering her work in galleries and shows across the country. Trish Weeks: Trish is a graduate of the University of Cincinnati College of Design, Art, Architecture and Planning with a BS in Design. She built a successful career in corporate and residential interior design before her painting career began in 1994. Trish has received awards in numerous juried shows on a local, regional and national level. Her work is included in private and corporate collections throughout the world. Trish was a featured artist at the Taft Museum “Art in the Afternoon” and a featured artist for the Duveneck Society at the Cincinnati Art Museum. 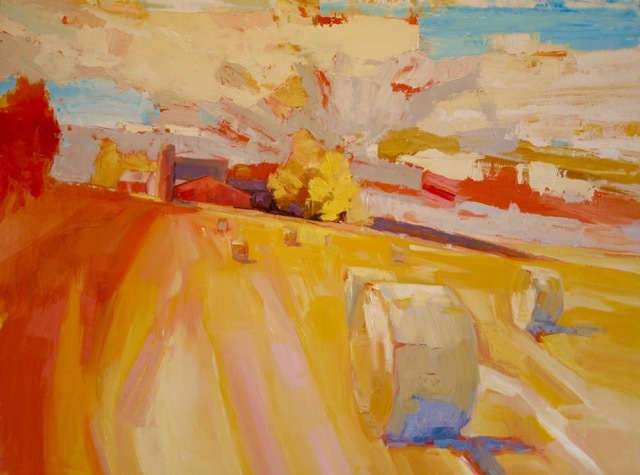 Trish has participated in events at the Carnegie Art Center in Kentucky and is currently participating in the “Definitive Contemporary Landscape Show” at the Covington Art Center. Trish draws inspiration from her experiences in the Midwest and the Carolinas where she spends much of her time. She also brings a more global perspective by layering memories from travels to paint in France; as well as trips to other locations in Europe, India, China, Japan and Nepal. Many of her trips include her portable equipment so she may paint out in the environments she is experiencing. Artist Opening Reception for Cody F Miller "Sojourners"
The materials I work with are magazine collage, acrylic paint, charcoal and cloth. The patterns and odd configurations of things I stumble upon are an integral part of the process of changing my original design, always leaving a doorway open for an element of chance. A number of images have more of an emphasis of paint over cut paper. Though the collage elements are integrated sparingly, they often set the tone for the rest of the design. Please join us on Friday, Nov. 2 from 4-8 pm for our 11th birthday party! Enjoy food, fun and meet your favorite artists in person plus get a jump on holiday shopping. Special discounts at the party plus a chance to win a painting! Meet The Artist Reception for Robert Coomer "Steeling Columbus"
Robert Coomer is an internationally recognized, award winning photographer who grew up on a farm in Brown County, Ohio. Art has always been a part of his life and in 1994 he graduated with a BS degree in Graphic Design from the University of Cincinnati College of Design, Art, Architecture, and Planning. 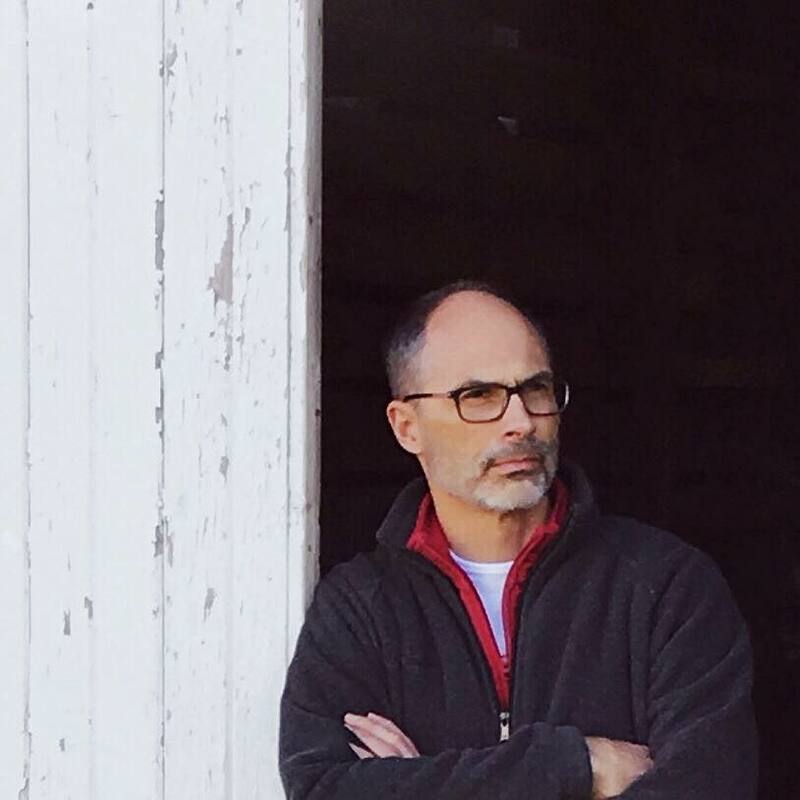 He draws from his farm roots to shoot images of backyard wildlife, old barns, farmscapes, and scenic landscapes in Southwestern Ohio and Eastern Kentucky. His work is an exploration of light and subject, and discovering beauty in unexpected places. I find beauty in age and decay, and then reproduce it in a way that maintains a sense of time and place. To do this, I use distressed steel as the basis of my pieces. It can take up to 3 months to build up the rust and patina patterns on each piece of steel and then up to 12 hours of surface work to strip and reveal the damage done. Once I have my surface, the image is printed to the metal with various techniques, and then float mounted on stained wood using distressed bolts that maintain the aged and worn appearance. Through this process I am able to create an emotional connection to the image, and produce a piece authentic enough to look as though it had been stolen from the scene and presented to the viewer as an artifact on display. The work is modern and industrial, but is equally at home among antiques and more traditional settings. Artist Opening Reception for Michael Bush "Abstracted Texture in Motion"
I am a self-taught multi-media artist. I experiment with different paint mediums on canvas to push my creative process. Rather than using brushes in my work, I use unconventional items to move and manipulate the paint. Water also is used in the creation of my work, which brings the fluid motions in my abstractions to life. I am inspired by work with movement and color, I strive to create similar movement and fluidity in my own work. I use nature as a direct influence in my work as my palette reflects a variation of blues and greens. I really hope you enjoy my work as much as I do creating it. Artist Opening Reception for Adam Kolp "Life, Inspired"
Adam Kolp was born in Westerville, Ohio, in 1978. As soon as he could hold a pencil, he started drawing and doodling. Adam’s desire to create led to a childhood dream of becoming an artist. When he was in high school, his vision started to decrease and he was diagnosed with Kerataconus, an eye disease that affects the structure of the cornea and causes vision issues. After graduating from high school, Adam continued his education at Otterbein College in Westerville, Ohio, studying Visual Art. Even though his vision became a constant struggle and he was placed on the cornea transplant list, he still continued on at Otterbein, taking classes and making artwork. After two cornea transplants and a pending graduation, Adam decided to return to Otterbein College and get a degree in education so he could share his love of art. Adam is a Middle School art teacher in New Albany. Adam enjoys sharing his passion for art with his middle school students so much that his job doesn’t feel like work. Adam also has established himself as a local professional artist, creating many original and commissioned pieces of art work. The struggle that Adam endured with his loss of vision has given him a unique view on life and living. He is constantly creating; drawing, painting, wood burning, researching new ideas and techniques, finding a new life for reclaimed materials, or falling back to how he started in 1980, doodling in a sketchbook. Join us for a special Psychic Saturday on July 28 from from 11 am to 4 pm. Willow, Lisa and Nada will conduct 20 minute private Tarot Card Readings @ $35 each - you can pay by cash or credit card after your session. Nada is also a Pet Psychic so you are welcome to bring your 4-legged friends for a reading. Don't worry if you can't make it to this one - our next Psychic Saturday is on August 18 from 11 am to 4 pm. Artist Opening Reception for Man-Wai Wu "A Change of Season"
Artist Opening Reception for Alicia Cummings "Enchanted"
Remember Mom with Jewelry from Hayley Gallery for Mother's Day on May 13, 2018. The Love Locked for Pelotonia event will be held at the beautiful Hayley Gallery in New Albany, Ohio, and will feature a cash bar with wine from New Albany's own Robert John Vineyards. Come see the debut of a new sculpture made from recycled bicycle parts specifically for this event! The father-daughter duo of Samuel and Crystal Davis worked together to create a unique art piece with a Pelotonia theme which will remain on display in the gallery through the summer months. Pelotonia is a grassroots bike tour that raises money for research at the Ohio State University Comprehensive Cancer Center — Arthur G. James Cancer Hospital and Richard J. Solove Research Institute. Love Locked event attendees may opt to buy a lock (or locks) and attach them to the sculpture in remembrance of or to honor a loved one. If you have any questions about ordering a lock or about the Love Locked event, contact Crystal Davis at crystal.davis@mail.com or at 614.699.BIKE. Thank you for your support in helping us work to end cancer! Artist Opening Reception for Laurie Clements "Conscious Color"
"Secret Columbus", a guide to the weird, wonderful and obscure in Columbus has just been published and we are honored to welcome author Anietra Hamper to a book signing at the gallery. The gallery is one of a select few locations where you can now purchase a signed copy of Anietra's book for $20.95 + tax. Artist Opening Reception for Jane Dippold "Painting with Paper"
I have been an artist and children's illustrator for almost 30 years. After graduating from Miami University with a Bachelor of Fine Art, I started my career working as an artist for Gibson Greeting Cards in Cincinnati, Ohio. Since 1994, I have worked as a freelance artist creating artwork for over 30 children's books, and countless designs for giftware, giftwrap and greeting cards. Since 2010 I have been creating fine art painted paper collages of the Ohio landscape. In my collage work, I paint acrylic paint on tissue paper, newsprint, recycled brown bags, book and poetry pages. I collect these painted colors into a palette to use at the start of a painting. I then tear, and sometimes precisely cut the paper, and adhere it to canvas in layers. This technique creates a painting that at first may appear as an oil painting, but on closer inspection, small pieces of paper, written words, newsprint, drawing and poetry become visible and provide additional meaning. The ways in which nature and the viewer can abstract the open landscape with color blocks, shapes and texture lends itself to the torn and cut pieces of collage. The randomness of the brushstrokes on the paper provides vibrancy and natural motion within the artwork. I work from photographs that I take myself, driving the backroads of western Ohio. I am inspired by the ever changing landscape and weather in Ohio as well as the flat open countryside, bright sunrises and expansive sunsets punctuated by barns, and silos. I want those who view my work to see and appreciate the beauty around us every day of the year in Ohio. Join us for Psychic Readings on Saturday, 2/24 from 11 -5 pm. Psychics are: Willow (Tarot), Debe (Palm) and Lisa Noland (Medium). $35 for a 20-minute reading. Reservations are a MUST! Call or text Jennifer at 614-633-6689 to book your reading. Credit cards accepted. Artist Opening Reception for Chuck Marshall "Visual Adventures"
Yes, she wants jewelry for Valentine's Day! And if your Valentine doesn't get the hint, pick out something you want and we'll let your Valentine know. Jewelry artist Terri Hickey will be at the gallery on Friday, Feb 9 bringing her handmade sterling silver as well as glass enamel pieces including necklaces, bracelets and earrings. Stay for a demonstration showing how she turns raw materials into beautiful pieces you'll treasure for years to come. Refreshments will be served at this special event. Artist Opening Reception for Jurate Phillips "Misted Visions"
I received my undergraduate degree from Bluffton University and my Masters degree from the McGregor School of Antioch University. In addition, I have studied painting at the International School of Art in Umbria, Italy. I currently paint, teach high school art and live near Urbana, Ohio. Join us as we debut our BRAND NEW GALLERY on Saturday, November 18. $50 for a 30-minute readings pre book below. $55 at the door (regularly $65-75) Credit cards will be accepted. To reserve a reading (or two) with the psychic of your choice, text 614-633-6689 & you will be added to the list at your requested time from 11:00-5:00. Get a FREE sage stick & instructions w every reading! Just in time for summer solstice manifesting! With the discovery of fire, early humans began to notice that aromatic smoke was produced by burning dried plants. As herbs, roots, resins and barks are changed from their physical form ("of this world"), they are changed by the element of fire into smoke (spirit world form). This transformation is indicative of the spirit within substances. Throughout human history, aromatic plants have been used in the daily activities of people from every culture. Soulshine Tavern located next to the gallery will be open for lunch and dinner. Artist Trish Weeks show ""Expressing Joy"
Trish Weeks is a graduate of the University of Cincinnati College of Design, Art, Architecture and Planning with a BS in Design. She built a successful career in corporate and residential interior design before her painting career began in 1994. Trish has received awards in numerous juried shows on a local, regional and national level. Her work is included in private and corporate collections throughout the world. Trish was a featured artist at the Taft Museum “Art in the Afternoon” and a featured artist for the Duveneck Society at the Cincinnati Art Museum. Trish has participated in events at the Carnegie Art Center in Kentucky and is currently participating in the “Definitive Contemporary Landscape Show” at the Covington Art Center. "My paintings are an expression of my love of nature. As a child my desire to draw began at an early age and I would put to use any paper surface my mother could provide for me. I hope to convey to the viewer the passion, beauty, and reverence i feel when exploring our magical natural world." Majoring in fine art at Kent State University, Carolyn focused on painting the figure. Her study of the human form proved later helpful in her anatomical renderings of the wildlife in her paintings. She worked as a graphic artist immediately after college and later for seven years as an illustrator's assistant. Carolyn has been represented by numerous galleries and has been included in local and national juried competitions in which she has been recognized and awarded for her paintings. $25 Readings (regularly $55-75) All are welcome! 614.633.6689 & you will be added to the wait list at your requested time from11:00-5:00. 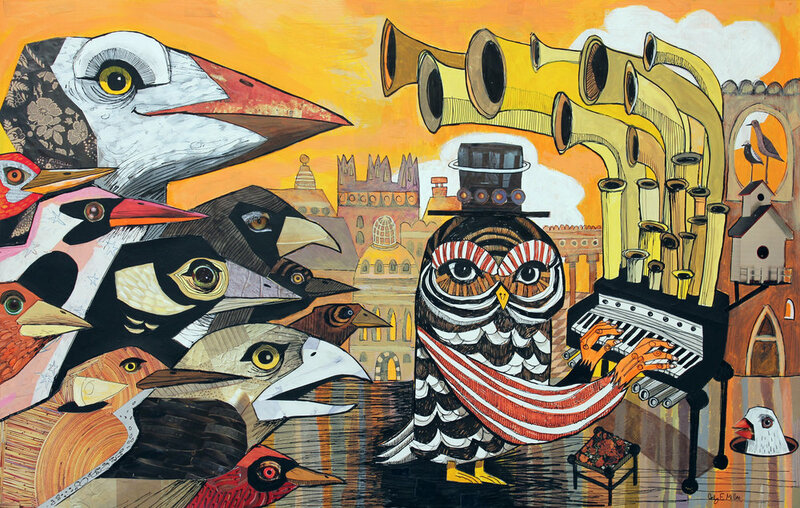 Hayley Gallery proudly presents Columbus, OH artist Wil Wong Yee in his very first solo show entitled "My Perspective". Meet Wil and enjoy his amazingly vibrant mixed media pieces depicting Columbus landmarks and local neighborhoods.